Casey Coppenbarger has had an eighteen year association with the Smoky Mountain Brass Band. For sixteen years he was the E♭ Soprano Cornetist but now has taken over the reins as our Musical Director. He is a graduate of the University of Wisconsin and the University of Massachusetts-Lowell, where he received his Masters of Music degree. He had been an adjunct Associate Professor at UNC-Asheville for 16 years where he taught applied trumpet, coached brass ensembles and directed the “Bulldogs Game Day Band”. As a performer he has performed across the Midwest, Northeast and Southeast as a member of the Dubuque Symphony Orchestra, the Symphony by the Sea, Brookline Symphony and of course our own Asheville Symphony. 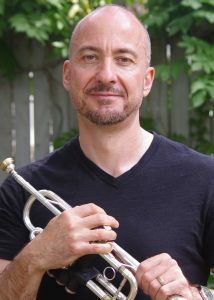 If you ask Casey about his 30 plus years of experience as a teacher, performer and clinician he will tell you that his proudest achievement is his 28 year marriage to the love of his life Nancy and their two awesome sons Nate and Cole.